John Healey MP has called on the Government to pledge support for the steel industry in this week's Budget. Last month, the Wentworth and Dearne MP, whose constituency covers Tata Steel's Aldwarke plant, welcomed an agreement for Tata to sell their South Yorkshire Specialty Steels operation to Liberty House Group. 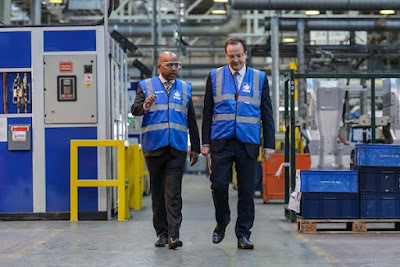 But he said Government support was needed and he has called on the Industry Minister Nick Hurd (pictured, right with Liberty's Sanjeev Gupta) to ensure backing for the steel industry is in the Budget. The call comes after leaked Brexit documents showed that the Government considered the steel industry to be a lower priority when it comes to the impact of leaving the EU. In the build up to the EU referendum, Healey, and others, argued that leaving the EU would not help the UK steel industry. Access to the EU market is seen as fundamental to Tata Steel's UK business. In his latest letter to the Minister of State at the Department for Business, Energy and Industrial Strategy, John said: "UK steel-making is a foundation for much of our wider world-class British manufacturing and no modern country can flourish without steel as one of its strategic industries. "So there is a strong case for government action on steel, and this is a case I have made to Ministers many times in recent years. "I trust in the Budget next month that the government will finally bring in the support that Ministers have talked about for our steel industry." The MP wants a "buy-British bias" in big Government projects and for them to take action on energy costs, business rates and skills and research funding. Mr Healey said that, since the National Steel Summit in Rotherham in November 2015, there had been "an unprecedented unity of views" from industry senior executives, trade union leaders and MPs of all parties – but there was little mention of steel in the Prime Minister’s industrial strategy.